Does the Post Office Deliver in Today's Urban Culture? The postal service has been ravaged by enormous deficits and massive layoffs. It will inevitably see the closing of thousands of buildings. Planners have taken notice. Countless journalists have lamented the loss of post-office buildings, praised their often remarkable architecture and called for pressure to save them. These buildings are catalysts of “community”, the authors have suggested, citing the chance encounters of townspeople. Something is profoundly wrong, we are told, when community incubators are eradicated. Certainly, the loss of these buildings signals the decline of an economic sector and inevitable job losses. Is it possible, though, that the focus on post office buildings overlooks contemporary urbanism? Could it signal inattention to the evolution of “community,” and an obsession with the 19th century? 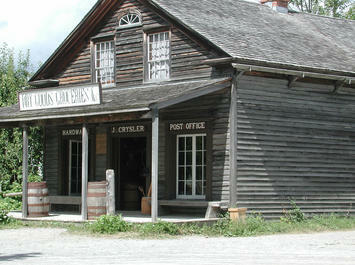 The Evolving PO: The post office building pictured at the opening of this article began its life in a traditional Canadian village of the 1860s. The 1800s was an era of the small entrepreneur and family business; fewer than 20% of families relied on a paycheque, compared to 80% today. The timber-merchant owner of this enterprise lived in a sprawling, classical style house that boasted status and refinement. By contrast, his 650 square foot store was a humble wood building. Even though its sign advertized dry goods groceries, it provided much more — it was a virtual mini-department store — including a postal service. It also supplied credit for up to a year, because farmers paid all their bills in the fall, after harvest. A similar pragmatic and profitable strategy of blending services now prevails in the K-mart, Wall-Mart and Target superstores. The idea is simple: a single service means only one source of revenue for the owner and single purpose trips for his customers. Neither is efficient, particularly in a small, walkable town. The store’s role as a community catalyst in comparison to the local tavern or church remains a matter of speculation. This 1891 example (below), is a stylish, elaborate 2000 square feet building in a town of 3,000 people, during the era of government-run postal service. Nearly four times larger than the first, it retails no other goods. Railway expansion, a bustling regional economy and a total reliance on postal delivery for communication, boosted business in Canada to annual revenues of $4,600 by the time this building surpassed its predecessor; a venerable sum when average daily wages were $1.50. The vast difference in building quality, size, civic importance and services, can be easily explained by the brisk business, the revenue size and, importantly, government ownership. Status and state symbolism could be financed with pride. Not for long. 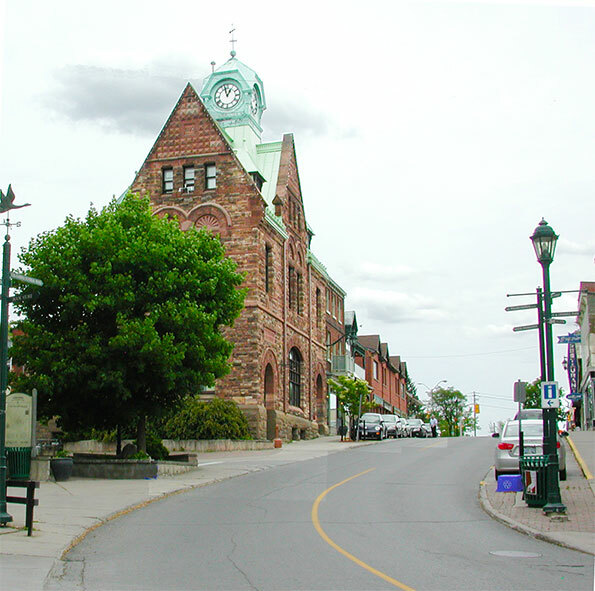 By the late 1960s only half of the 33 ornamented buildings in Ontario were still standing and none were owned by the government. The loss and shift in ownership had little to do with planning. A new urban culture of instant, and distant, paperless exchange had emerged that forced the transition to the next “building”. The Village Option: Today, it is not uncommon to see locations where the postal service counter occupies a miniscule portion of a small drugstore on the ground floor of a 20-storey apartment building. It resides on a principal artery, but without street facade, not even a sign announcing it. As in the village example, the service is only one of many the building houses: habitation, car park and a chain drugstore that offers the gamut of goods including convenience foods and drinks. Management’s “building” choice has reinvented the village option, where the PO is not housed in a separate building. In his turn, the retailer, opting to rent space for a postal service, knew the benefit of luring customers by mixing services on the same premises. The new urban condition, by now in full swing, puts the postal service in an appropriate symbiotic niche, reflecting its cultural status and economic value. The uncertain “community” incubator role that it might have played in the 1800s cannot be discerned in its current form. The postal service trajectory is not unique. The 20th century saw the decline of the church, the pub, live theatres and classic movie theatres. Of all the buildings that are presumed to play a catalytic community role, none rivals the church. Historically, innumerable towns sprang up through faith groups. Church buildings were their focus and intellectual well-spring. Nonetheless, the 20th century treated the church no differently than it did the pub and the post office. By 2005, of the 60% of US citizens who said they were religious, less than 20% attended church regularly. Attendance among US Roman Catholics fell from 75% to 45% in the last 60 years. In the UK, annual church attendance stands at 12%, in Sweden at 5%, and in Denmark at 3%. These are striking figures for an institution that has been a cornerstone of “community”. The outcome of this abstention is inevitable: churches are demolished or converted. Should the Pub Get a Sub? Pubs in Britain were closing at the rate of 27 a week in 2007 and 2008, continuing a downward trend that affected their small town numbers disproportionately. The media lamented the loss of a celebrated social tradition and, with it, exquisite examples of architecture and interior design. This loss of building-and-function raises the question of preservation, which leads to the question of subsidization. Should the pub get a sub to support its important value as social cement? Should other such buildings and their functions be subsidized? Some planners think so, in sharp contrast to the historic Protestant ethic of self-reliance. This view permeates the pro-preservation articles on post offices and pubs. It implies that social incubator functions may well deserve a subsidy, and may function better when protected from heavy traffic. In contrast to this view is the vast array of traditional village and towns of exemplar urbanism, where a thriving Main Street is also a main thoroughfare through the town. A New Era: The loss of post office, church and pub buildings does not stem from some wrongheaded, antisocial planning philosophy that needs to be debunked, denigrated and disposed of. It is simply symptomatic of cultural, technological and economic shifts that go way beyond the realm of urban planning. To stop the loss of post offices, for example, it would be imperative to rescind the use of e-mail, fax and phone, an absurd proposition. For the salvation of the church, it might mean a new wave of proselytizing that would result in commitment to attendance, also a bizarre projection. Subsidies, protestations and benevolent planning decrees are hardly the answer for either existing or new communities. The urbanist’s “community” dilemma dissolves when the transition to a new era is recognized and embraced. Rather than compulsively hold on to “community’s” past loci, let's stir the imagination toward its emergent places. Fanis Grammenos is the founder of Urban Pattern Associates (UPA), and was a Senior Researcher at Canada Mortgage and Housing Corporation for over 20 years, focused on housing affordability, building adaptability, municipal regulations and sustainable planning. Research on street network patterns produced the innovative Fused Grid. He holds a degree in Architecture from the U of Waterloo.